When I wrote my long-range plans for this year, I decided to use a calendar math activity each day. My class has more second-graders than third-graders, and there are quite a few students with special education needs. So... I felt like there were gaps to close. As we approach the end of this second month of school, I am beginning to see great results and I'd like to share how I'm using the product I created. I am not getting into every detail of what I do, but rather focusing on the highlights. 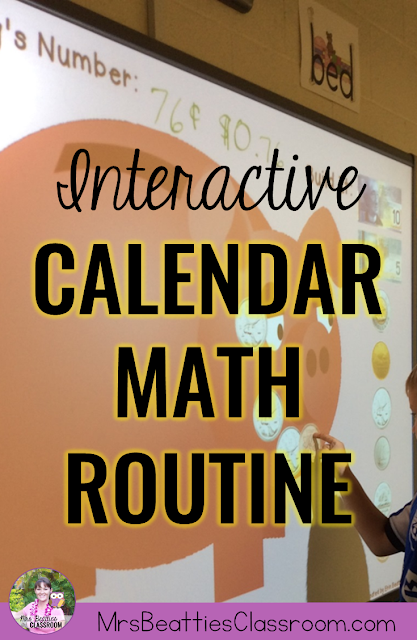 My Calendar Math resource has been created for use on a SMART Board. We begin by quickly discussing today, yesterday and tomorrow. Most of my students have a good recognition of the days of the week, but we are consolidating this skill for a few of them. We then complete the date by dragging the date digits from the number bank on the left into the calendar space. I have the next clip art image already in place for the day before we begin. At the beginning of the month the students are so eager to guess what the pattern might be. We have many discussions about the "core" of a pattern, and how we need to see the core repeat before we can be sure there is a pattern occurring. Once the pattern is established and the children recognize the core, they begin to make predictions about when we might see a particular shape again, or which shape will appear on a given day. They are encouraged to use strategies other than simply extending the pattern. For example, this month, when the students noticed the diagonal trend of the images, they predicted that Halloween would have a pumpkin because they could see there will be a ghost on the Tuesday of that week, and the pumpkin happens two days later. Love it!! This month, as we launched into our unit on addition and subtraction, I introduced the possibility of using subtraction to find the difference between two dates on our calendar. We looked at the birthday on the 16th and the birthday on the 5th, and found out how many days were between the two by using subtraction. This is something we will continue in the months to come. One additional skill we have spent a great deal of time working on is time. My students are beginning to recognize the relationship between days and weeks, weeks and months. They love using this knowledge to help with telling the number of days between events on our calendar. They no longer simply count all the days, but rather use what they know about a jump downward on the calendar to add 7 days. You can do all of this with any calendar, but I love the interactive nature of the SMART Board and how it engages my students! In addition to all this great stuff, there are several calendar math pages contained. I sometimes have my students complete one of the worksheets rather than doing this whole-class, and sometimes we do a combination of the two. Either way, it is a great review of place value and representing numbers in a variety of forms: word form, expanded, money, base ten blocks to name a few. Using this page, we practice our skip counting patterns - 2s, 5s and 10s. This is one area that I've seen a great amount of improvement. The students can clearly see how skip-counting makes counting the number of days easier! They are also beginning to recognize when 2s are most effective, or when 5s or 10s would be a better choice! Take a look at more great SMART Board resources on this Pinterest board! Thanks, Erin! I just bought the older grade one. It looks great! My class will love it! Thank you for purchasing, Lisa! I'll be updating that version in the coming weeks as well. I'll let you know when it is ready! I really like the layout you have for this, do you have it for sale on teachers pay teachers? Or is there a way I can get this product? I actually have several versions of this available on TpT. You can find them by visiting shop.mrsbeattiesclassroom.com and look for "SMART Board Calendar Math" on the left side in my categories list.